A Memorandum of Understanding was signed between Ok Tedi Mining Limited and the Papua New Guinea Civil and Identity Registry for the roll out of the PNG National Identification project in the Western Province on Friday 20th July. The signing took place at the OTML Whitehouse Boardroom between the Minister for National Planning, Hon. Richard Maru, Civil and Identify Registrar General Michael Kumung and Managing Director and CEO of OTML, Peter Graham. 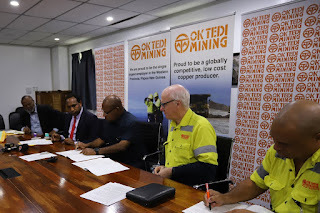 “Ok Tedi welcomes the distinguished delegation to Tabubil for the signing of an MOU between the PNG Civil and Identity Registry which outlines the partnership between these two organisations to make registration more accessible to our employees, contractors and community members,” MD and CEO Mr Graham said. “Ok Tedi is pleased to support this important government initiative which will benefit our employees, contractors and local communities. I am optimistic that this delivery model will be successful in extending the coverage of NID and hopefully other employers in PNG will follow suit,” Mr Graham said.